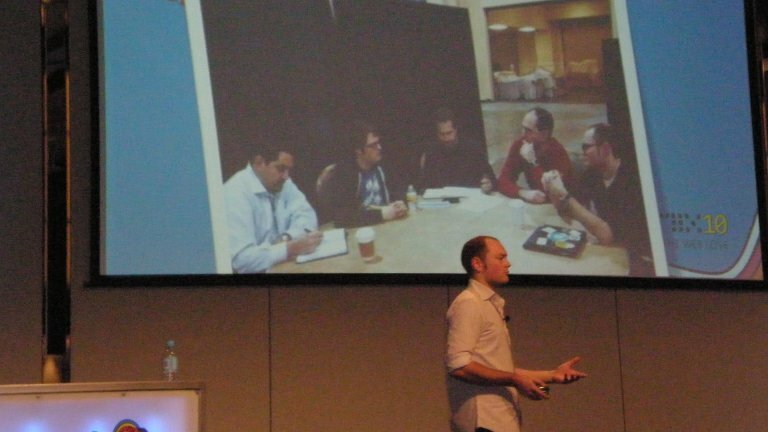 The keynote began with a presentation from Foxtel about improving the “dumb box” that’s plugged into your TV. Foxtel through a partnership with XBOX Live (and Microsoft) is attempting improve the user experience in the home when it comes to pay-television. They are following the “three screen and the cloud” strategy that Microsoft is currently engaged in. This lead into a demo of using the Microsoft Surface to interact with various Foxtel services. The objective being that the Microsoft Surface can be one of the three screens. A more social experience to support discussion and digital interaction between people (once the Surface less financially inhibitive). 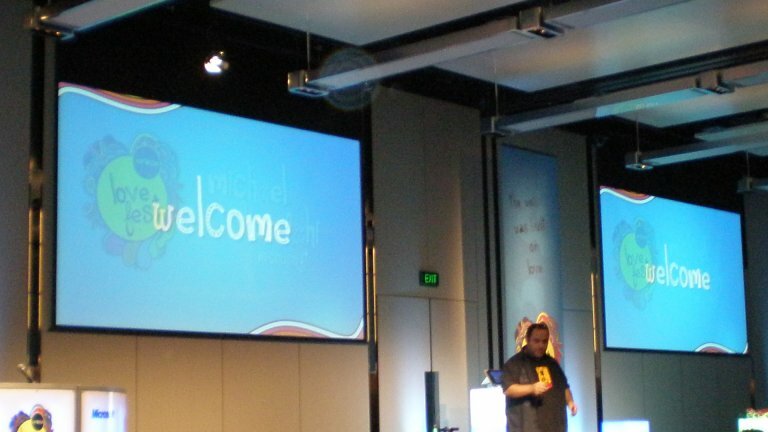 The demo consisted of an application that allowed for interaction between a Windows Phone 7 device, the Surface and a slate like device, where-as the device would detect proximity/engagement in another digital activity (in this case watching Foxtel). Then subsequent devices (the slate) would offer to assist in the interaction, by offering supporting information, show/character information, maps of locations and other rich interactions. 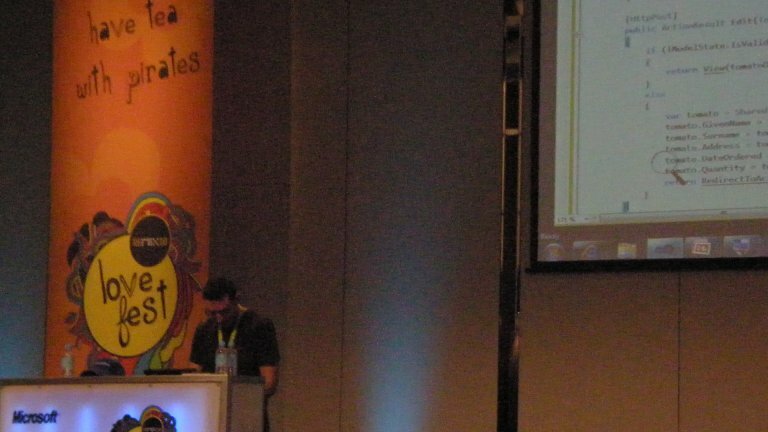 IE9 – Features/demos and road-map. Expression Blend – Some new features in 4. User eXperience – Sneak peak at Shane’s session. Microsoft Live Labs Pivot – Introducing OData. Windows Phone 7 – The developer experience. Summary line: The objective is to create an ongoing journey on the web (and not be focussed simply on destinations). James started talking about the focus shift of Microsoft towards open source projects and how they are contributing to jQuery (this was announced at Mix in March 2010). This came about from the ASP.NET Ajax library that MS was working was a prime candidate for integration with jQuery (through contribution). James had a great story about John Resig “assisting him” with some code, John achieved this by first doing a select all followed by hitting the delete key then refactoring from memory, James was amazed. 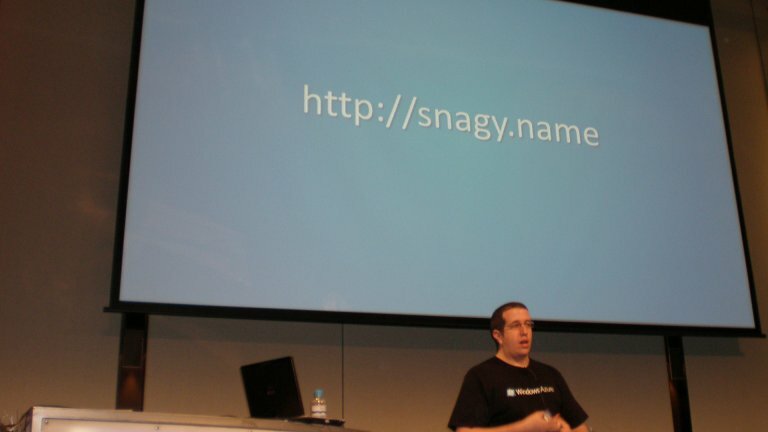 The use of the twitter search demo application was focussed in particular to demonstrate the initial contribution Microsoft is undertaking for jQuery – Templating. Which is a feature to assist with displaying/rendering data from a source, via a new render() method. This was a very different session that the usual one (and in a good way). 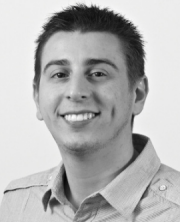 Phil gave some insights into the history and how it relates to his adventure with DotNetNuke. It started as early as 2001,2002 as an open source CMS. A few years ago had grown a company paying 7 employees offering support and other services in relation to DNN. It has in the present day reached around 40 paid employees after a few rounds of venture capital funding and is a fully fledged company. Phil had some advice for “getting paid in open source”, this was a general topic and in response to a direction question. 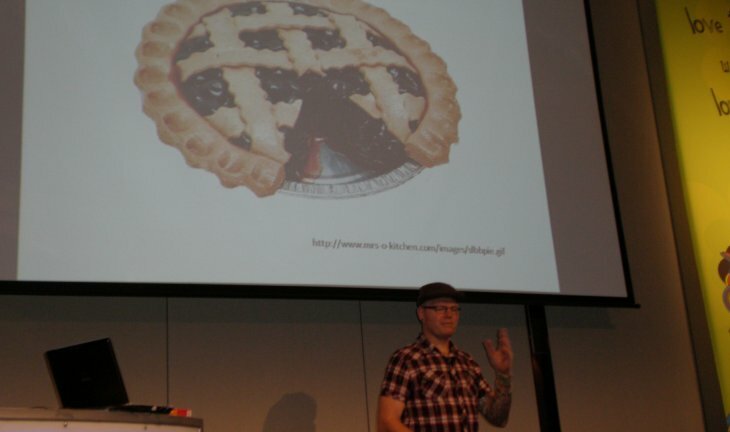 Phil’s discussion was along the lines of; ensure the “pie” is large enough so that your piece is as good as having a whole pie… The rationale behind this was, if it’s a large pie with lots of contributors the burden on the individual is less when compared to being responsible alone for an entire pie. Need a good dedicated thick skinned leader. Protection of code and community is essential. Recognition for those that help and further engage/promote (give kudos). Always offer an upgrade path for users of your product. Steve after introducing Windows Azure, focussed on some real world case studies of companies making use of the cloud, in particular the Azure platform to grow and improve their business. Company: Connect2Filed. Service: job/customer/billing management internal Software as a Service. Company: CaterExpress. Service: foodstorm. Software as a Service customer and food management application. On/off (typical business hours, localised to only a few timezones). Predictable (peak times of year). Easier (helpful for a start-up). Less risk (redundancy taken care of for you – 3 factor redundancy). Areas (areas in different projects is available in the ASP.NET MVC futures). Security (via auto html encoding – “&lt%:” and MvcHtmlString as the return type for helpers). Improved RESTful approach (via HttpMethodOverride eg [HttpDelete]). I’ve scattered some links throughout the list above, check out those references. Also checkout this white paper on what’s new in ASP.NET MVC 2.